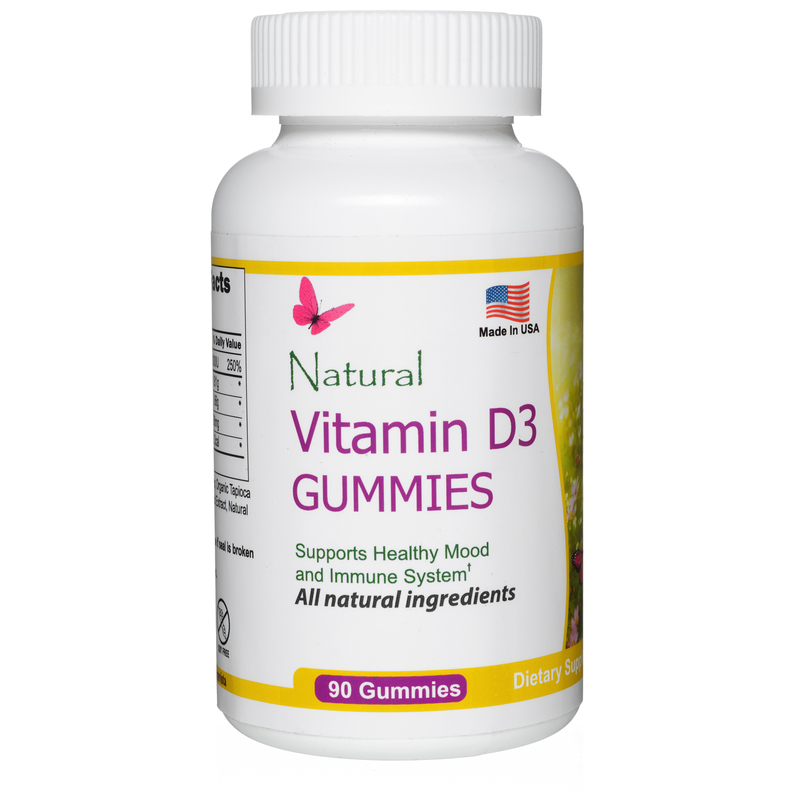 Our Vitamin D3 Gummies Are a Great Source of Vitamin D.
Vitamin D is important in the absorption of calcium for strong bones, a healthy mood and facilitating normal immune system function. * In modern life today, it can be hard to spend enough time in the sun to get the adequate amount of vitamin D that our bodies need. Our Vitamin D3 Supplement is a great solution that will help you meet get your required daily amount of vitamin D. Vitamin D3 works with your body's natural defense system to keep it strong and healthy. We are committed to only Using Natural Ingredients, Coloring Agents, and Flavors. In addition to ensuring your body gets the necessary sunshine vitamin, our Vitamin D3 Supplement comes in the form of tasty, gelatin free gummy bears. We choose not to use Gelatin or High Fructose Corn syrup, in any of our products because of our commitment to only use natural ingredients. 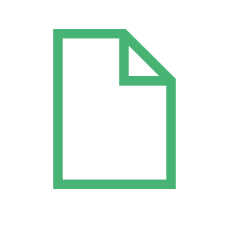 We use Organic Cane sugar, Tapioca Syrup and Seaweed Extract as flavors because here at Pharmvista, we are committed to using natural coloring agents and flavors. 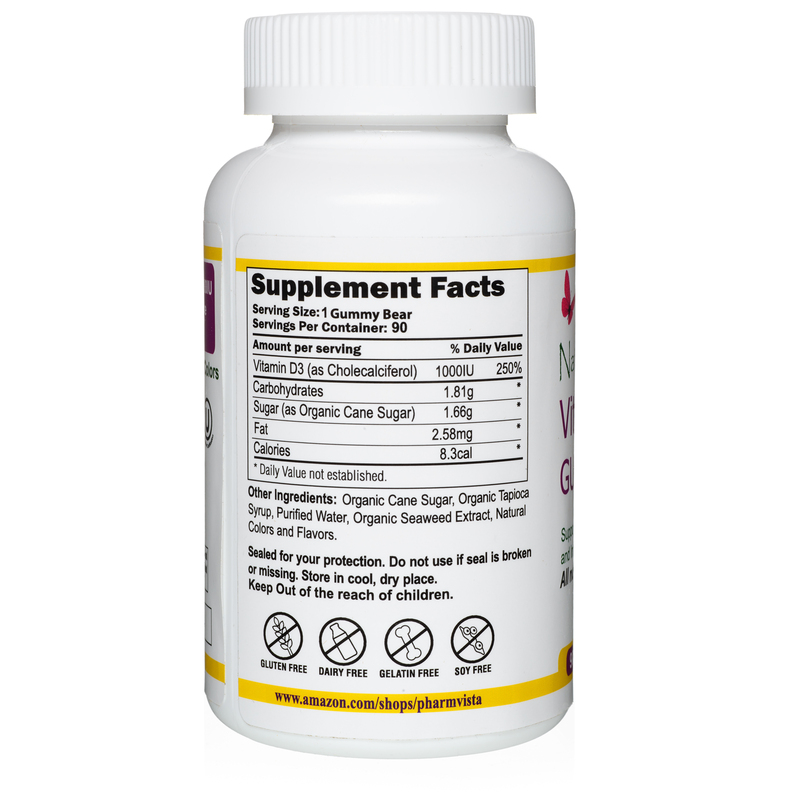 Lastly, our Our Vitamin D3 Supplements are soy free, dairy free, gluten free, and are a non-GMO product. *These statements have not been evaluated by the FDA. This product is not intended to diagnose, treat, cure or mitigate any disease. Indications :- For adults and kids greater than 4 years old. Dosage :- As a dietary supplement, have 2 gummy bears in a day. Chew thoroughly before swallowing.